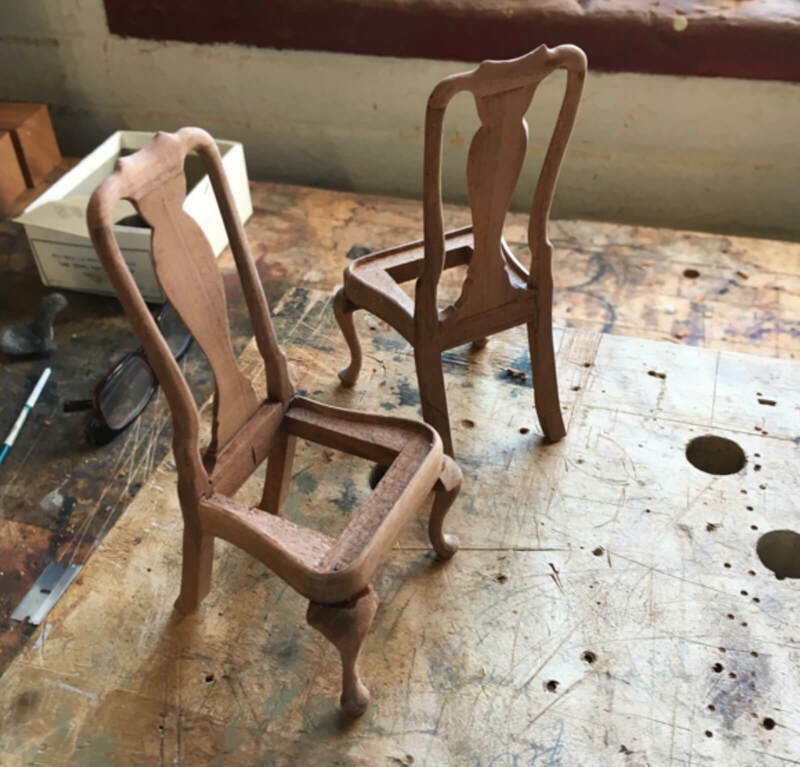 I have never had the least interest in making tiny furniture. 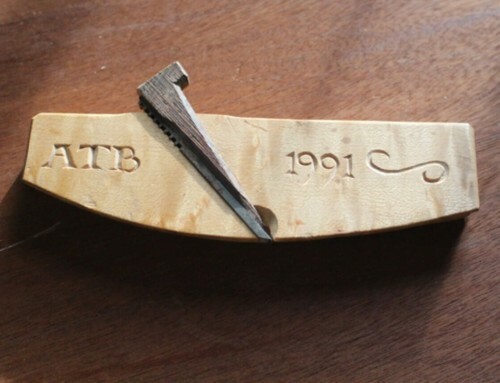 For the same amount of work I could make a big one of whatever Barbie sized piece it was. It snuck up on me. My best customer had given me an 18th century English dollhouse to restore, one of four early ones she had acquired. The one I had needed a lot more work than we suspected at the start. This was not your amateur making something in the cellar that the little darlings could scrape up with toy soldiers dollhouse. 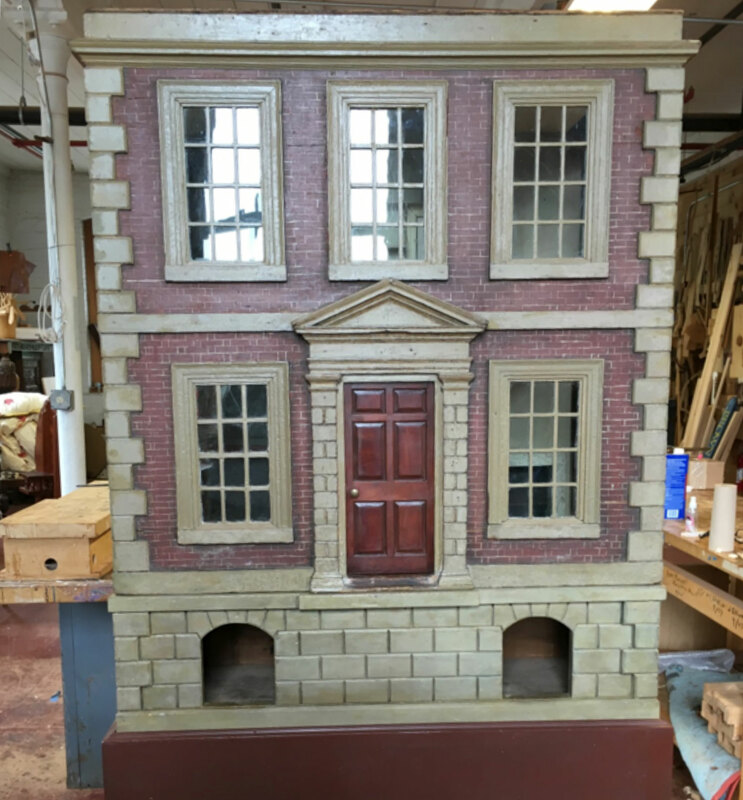 This was a Downton Abbey kids’ dollhouse with exact to scale moldings and pedimented front door dollhouse, a to be played with under the supervision of a Nanny dollhouse. 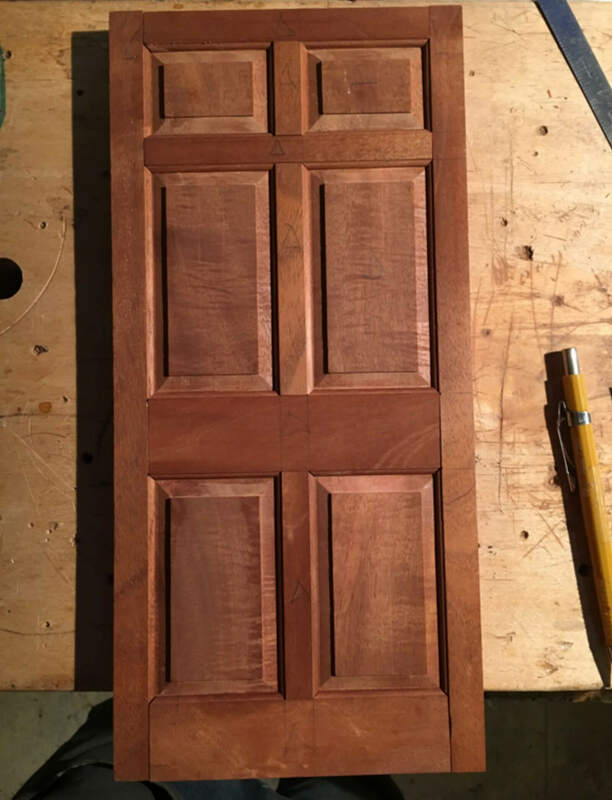 I started off by making tiny little scrapers to make all new three-step mahogany window banding for all the inside window trim. Then a new newel post and railing was needed for the front hall. I thought we were about done after I had then made new end doors for both ends of the house- basically walls on hinges to allow access to the inside. 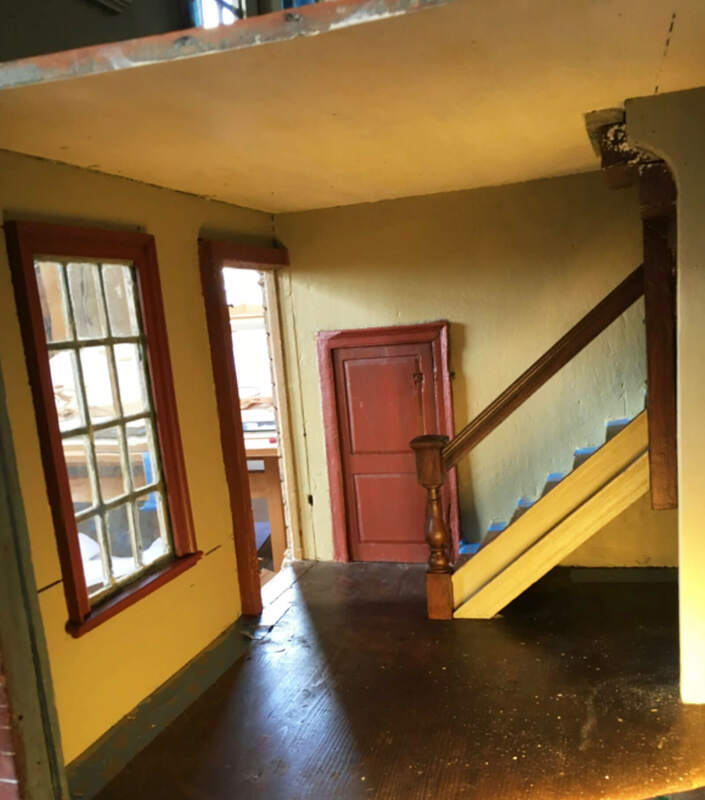 The house lingered in my shop for an embarrassingly long time, as if its inhabitants had been called off to a foreign land on some kind of mysterious mission. The owner and I were in touch again and it was brought up that there was going to be a museum exhibit involving this and the other houses. It was months away. 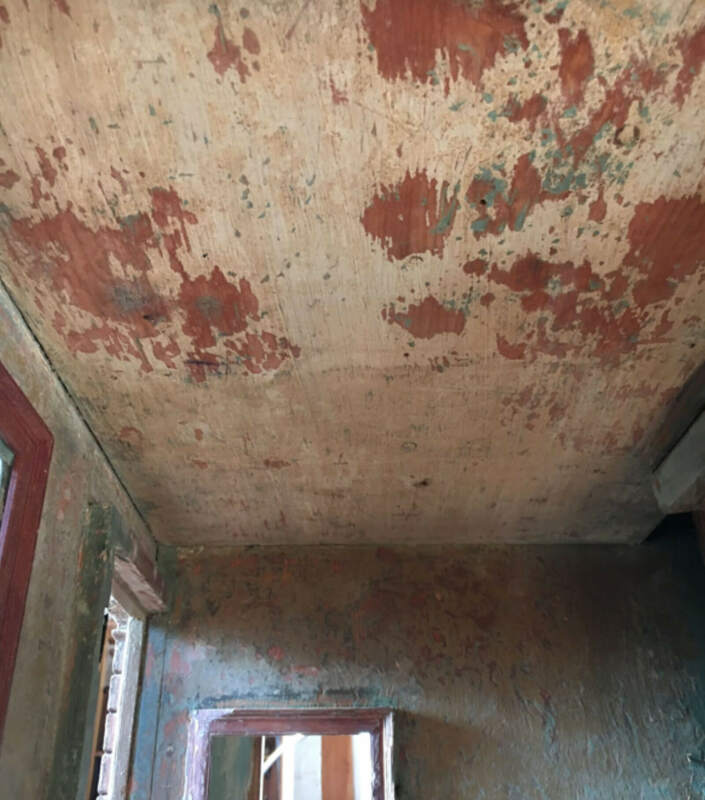 Could I maybe figure out what the original colors in the rooms were? I blithely said that I thought so, and maybe I could copy the colors and repaint the interior. Using acrylic, reversible paint, of course. I quickly consulted with a top conservator friend who filled me in on what to use. After considerable effort involving what I think may have been some Yoga moves to get my head and my arm with the paint brush into the 14 X 16 X 12″ rooms, I got the paint done. It looked pretty good once I re-marbelized the fireplace surrounds, made two new interior doors, an overmantle frame and three built in shelving units. Did I mention a new Cuban mahogany six paneled front door to replace the old one? Found out it was plywood. At this point the house looked great on its new faux-stone base with arcaded cellar windows. It was ready to go home to be dressed up with whatever you put in 18th century dollhouses. 18th century dolls, I supposed. Here it should be noted that I have made many pieces of “big” reproduction furniture for the owners of this tiny house. Well, I started getting into it pretty seriously after that first table with the 5/16″ ball and claw feet. We filled in the gaps in the little peoples’ furnishing plan with: a hutch, a kitchen table, a corner cupboard, a side table, three tall post beds, one ebony 17th century one, a lowboy, a gilded mirror, a parcel gilt walnut mirror, a candle stand, a wooden wall cistern, two Queen Anne mahogany side chairs, and a workbench for the gentleman cabinetmaker of the house. Although I was literally seeing double at the end of the day, the house was spectacular, the museum exhibit was a huge hit, and I’d only used half a shoebox of scrap wood and my tiniest carving and joiner’s tools. The big shock came when I got my annual eye exam a few months later and was informed that both my near and far vision had…improved! Dovetails and DrawsPractice drawer construction and cutting full, half blind, angled and blind mitred dovetails by hand. Newport Four Draw ChestAn iconic example of American design, incorporating concave and convex shells, blocked front and unique scrolled ogee bracket feet. Wicked Sharp WeekendTool sharpening workshop. 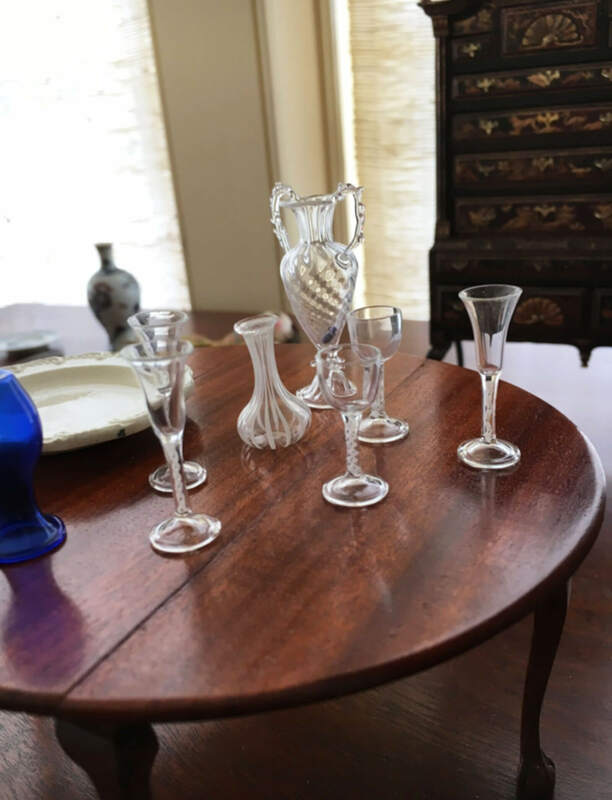 Shells, Fans, Flowers and FinialsThe best pieces of early furniture are distinguished by their decorative elements. One Draw TableLearn how to build a high style country one draw table. Carved FootstoolThere isn’t a project much better than a stool to cover lots of hand woodworking skills, from basic joinery to carving. 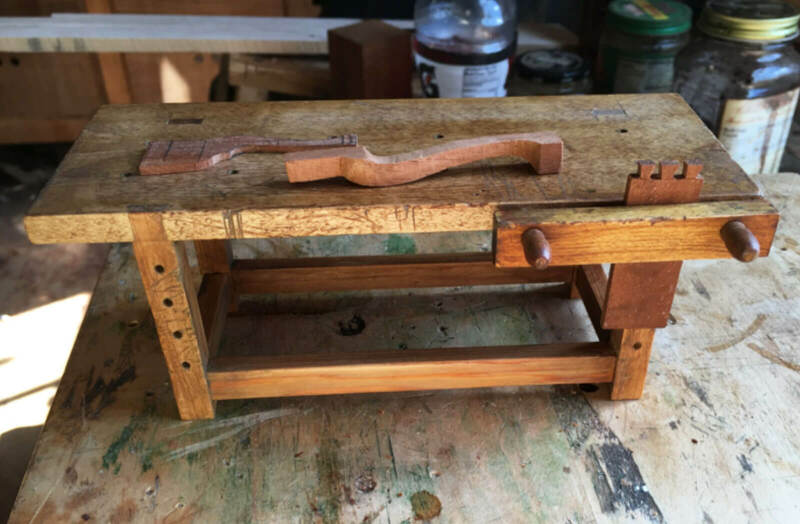 Introduction to Hand ToolsBasic hand tool use through the process of building a small box with a sliding lid. 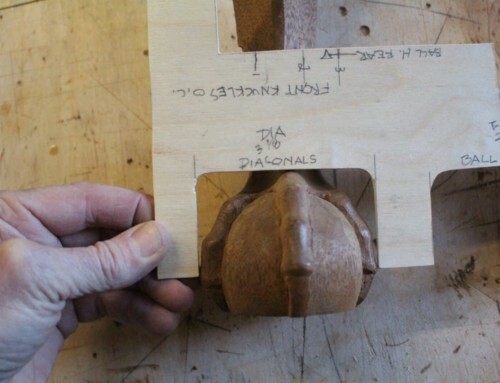 How to Use Carving ToolsA step by step approach to carving with hand tools. 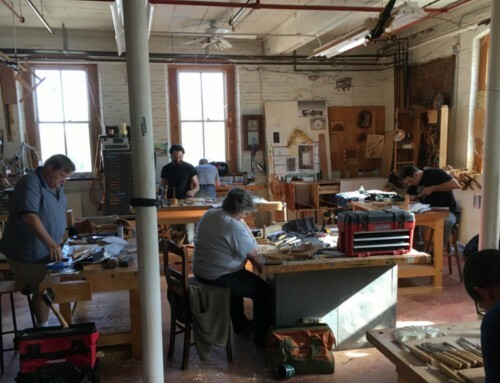 One Day Ball and Claw ClassThis one day class will help you understand how to choose the right tool for each element as well as how to modify tools for specific purposes and put all the measurements for the foot on one simple gauge. Carving in the Newport StyleLearn the hallmark elements: shells, ball and claw feet, bracket feet and knee carving. 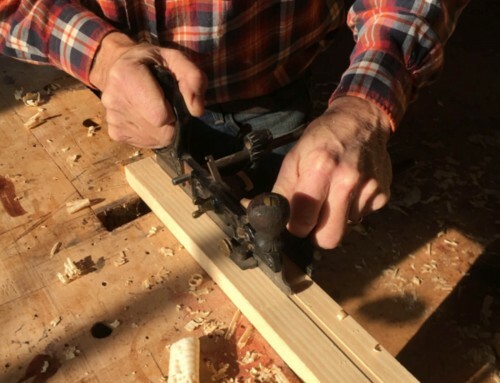 Learn the subtleties of design and construction essential for authentic furniture reproduction.